A Faster Way to Save. We’re happy to help you with any questions you may have. Stop by, call us, or simply open an account online today! *APY = Annual Percentage Yield. e-Money Market Account – Interest is compounded and credited monthly. $5,000 minimum daily balance to a maximum of $500,000 to earn stated APY. 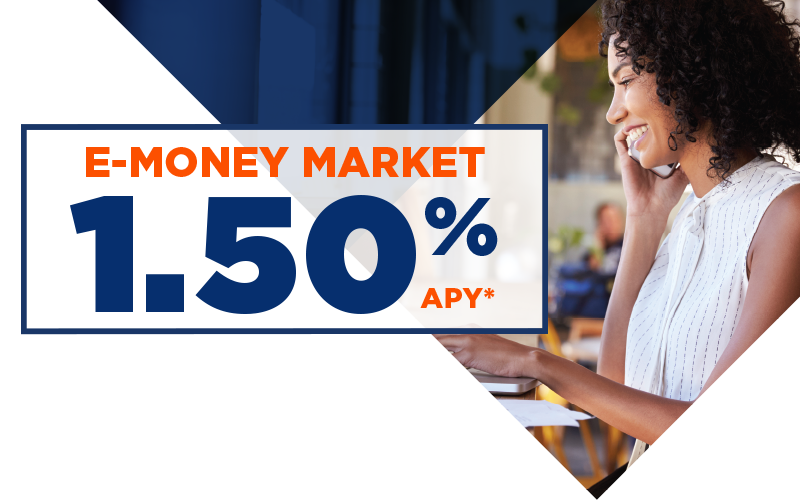 Current e-Money Market balance tiers: over $500,000 – 0.05% APY on entire account balance; $5,000 to $500,000 – 1.50% APY; $500 to $4,999.99 – .35% APY. There is a $500 minimum daily balance required to avoid $5 monthly service charge and to earn interest. Transfers from a Money Market account to another account or to third parties by preauthorized, automatic, telephone, or computer transfer or by check, draft, or similar order to third parties are limited to six per month. Fees could reduce earnings on this account. Rate may change after account is opened. Offer valid on new money only. *APY is accurate as of 7/9/2018.